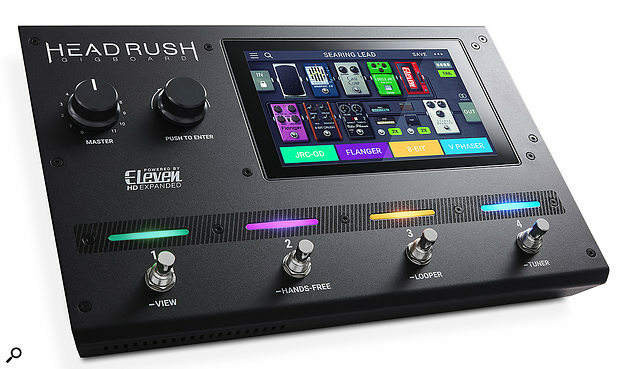 Many of the several companies currently vying for the 'ultimate guitar floor processor' also offer slimmmed-down versions of their flagship products, which aim to deliver the same quality in a more affordable, convenient form factor for those who don't need access to every feature. The Headrush Gigboard is one such product, and is based on the larger Headrush Pedalboard (reviewed in SOS September 2017). The Gigboard has one of the most intuitive interfaces I've yet encountered, courtesy of its seven-inch colour touchscreen. The screen supports all the usual double-tap, drag and swipe functions we've come to expect from tablets, to the extent that I could spend a few hours exploring the unit with the supplied quick start manual still sealed in its bag! A full manual, available online, will help you understand the full power of this device, though. It reveals various features that are less obvious, including that the more vain performers out there can even load in their own band logo to display when the screen is locked!